“SHE HAD A VERY INCONVENIENT HEART. IT ALWAYS INSISTED ON FEELING THINGS EVER SO DEEPLY,” WROTE JOHN MARK GREEN. He was undoubtedly describing an empath in this line. 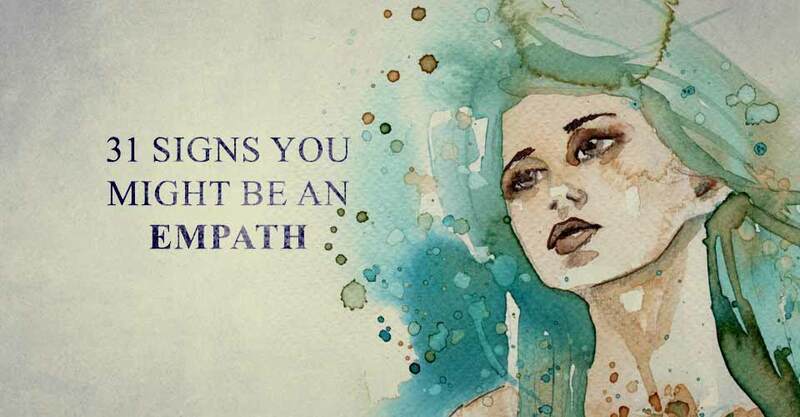 To put it simply, an empath is a person who feels emotions with a very high level of intensity. They are creative, compassionate, and deeply connected to others and the world. However, they are also easily overwhelmed by all of this. 1. You seek balance and comfort, rather than ambition and success. 2. When you hear a troubling story, you feel heavy for days. 3. You love connecting with others one-on-one. 4. You need to spend time alone to recharge. Spending time with others is rewarding, but also draining. 5. You find powerful meaning in music and art. 6. You avoid crowds. You become overwhelmed by all of the energy you pick up on. 7. You direct most of your emotional energy into helping others. 8. You would not like to live in a big city. If it were up to you, your home would be high in the mountains or deep in the woods. 9. You don’t like to watch violent movies or TV shows. 10. You do not function well when your energy is spread between many trivial things. You prefer to dive deeply into one important “passion project”. 11. You are often called the “mom” of your friend group. 12. You experience vicarious trauma when a loved one is hurting. 13. Your friends go to you when they need advice. 14. You need to spend time being creative. You may choose to paint, knit, bake, write, or sing – it doesn’t matter as long as it brings beauty to your life. 15. You’ve been told that you are a good listener. 16. You become stressed when you are over-stimulated. 17. Most people do not understand you. 18. You will go out of your way to avoid stressful traffic. 19. You feel a healing energy when you spend time in nature. It connects you to the world and grounds you to yourself. 21. You need to dress comfortably. If you don’t, you will feel distracted all day long. 22. You most easily express your emotions through creative endeavors. 23. People who don’t know you well may consider you shy, cold, or standoffish. 24. You avoid confrontation at all costs. 25. When you have a disagreement with a friend, you often feel drained for days. 26. You are often overwhelmed with fear and sadness. 27. You are often overwhelmed with joy. 28. You struggle to control your emotions. You often feel compelled to howl with grief or squeal with excitement. However, you don’t want to draw that kind of attention to yourself. 29. You often wish you felt things less deeply. 30. You’ve been told to grow a thicker skin by some, and to stop holding in your emotions by others. 31. When all is said and done, you wouldn’t trade this gift for anything. As Anthon St. Maarten understood, being an empath is a very powerful strength. LEARN TO HARNESS YOUR ABILITIES. Your gifts of peace, compassion, and sensitivity can do a lot of good in our world.